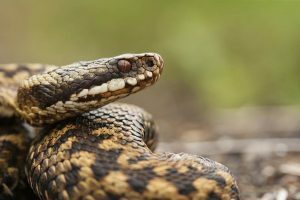 There are six species of reptile in the British Isles (only one is native to Ireland): Anguis fragilis slow worm (small introduced populations in Ireland), Zootoca vivipara common lizard (native in Ireland), Lacerta agilis sand lizard, Vipera berus adder, Natrix natrix grass snake and Coronella austriaca smooth snake. All of Britain’s reptiles are protected but sand lizards and smooth snakes which are restricted to small areas of the UK are European Protected Species. The other four ‘common’ species are widely distributed across the UK. Where they are present, sand lizard and smooth snake require full consideration during the planning and development process, with developments likely to affect them requiring full baseline information and a licence to allow them to proceed. The common species are protected from killing and injury. In order to ensure that reptiles are not killed or injured during development survey and translocation may be required. To meet the requirements of legislation it is important to ensure that any population has a good chance of survival when moved to a new habitat. Reptile survey and translocation are best undertaken in spring and early summer and late summer and autumn. Survey and capture techniques are based on the use of artificial refugia, encouraging reptiles to bask on them. During mid-summer reptiles do not bask for long enough to make it likely to record them. Reptiles hibernate between November and February.